On Tuesday, June 19th at 7:00 PM our Tustin City Council will vote on the Downtown Commercial Core Specific Plan (DCCSP). The City wants to narrow First Street to one lane of car traffic between Newport Ave. and the 55 Freeway! We're working to keep Tustin's roads flowing. Eliminating lanes on our busiest streets won't help that—in fact, it will hurt our businesses and the jobs they provide. Road diets are an unsafe and inefficient proposition to improve our roads and city. As part of the Downtown Commercial Core Specific Plan (DCCSP), the City wants to reduce car lanes on First Street (between CA-55 and Newport Ave.) down to one lane in each direction. They’ll replace the lanes with diagonal parking, bike lanes, and wider sidewalks in the name of revitalization. They’re not discussing how disastrous arterial road diets actually are for communities. In Playa del Rey, daily commutes increased by as much as AN HOUR after the Vista del Rey Road Diet in summer 2017. After the 2017 Venice Blvd Road Diet in Mar Vista, Waze users reported notices of 45 minutes to travel just 6 blocks during peak traffic times. These cars have to go somewhere. Waze and other navigation apps will route them through our Old Town neighborhoods instead. Keep cars on First Street so our residential streets remain safe! Every moment counts when lives are on the line! Do you want to be the one waiting for help to arrive? LA’s experiments with road diets have caused local mom-and-pop businesses to suffer heavy losses, lay off employees, incur burdensome debt and even close up shop altogether. Seven businesses have closed on the stretch of Venice in the year since that road diet began in May 2017. Owners in both Mar Vista and Playa del Rey experienced immediate drops in sales (25-45% reported), even at businesses with 35+ years of operating history. When the road diet was removed in Playa del Rey, business slowly returned to normal, however, the losses took a heavy toll on owners. Talk to Us. Sign Our Petition. Want to volunteer your time and talents? Or start a KeepTustinMoving group to fight for the roads in your neighborhood? Or donate a larger sum to support the cause? Just let us know. Tell us how Road Diets have hurt you. Can't get out of your neighborhood? Is your business suffering lower sales or productivity? Whether you're unable to get to the doctor or just can't make it to work on time, your stories can help! Please fill out the form below, and make sure we know how to reach you. Be sure to indicate if we can use your story in our efforts and/or share it with the press. 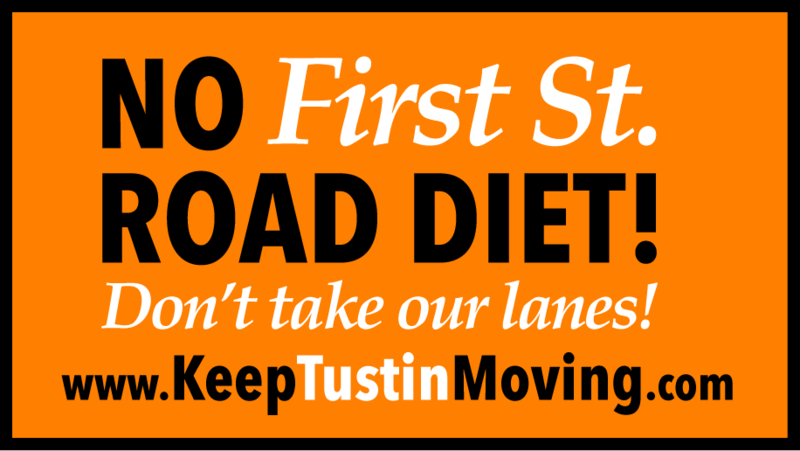 What is the Tustin Road Diet?